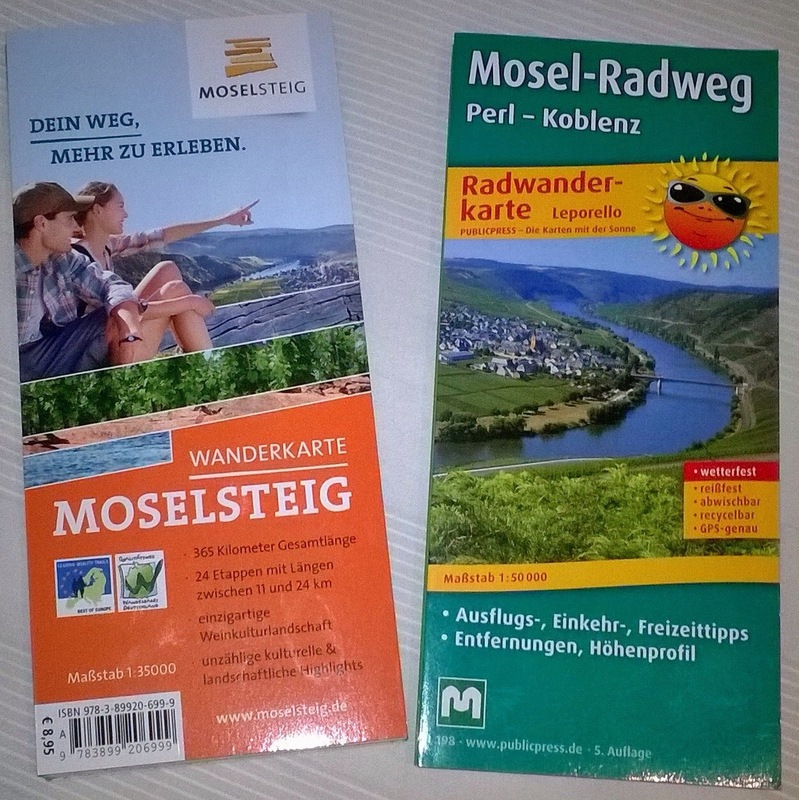 For lovers of cycling and walking in the Mosel there are two maps which I can recommend. Both are in German but that is not a huge deal as they are very clear, the keys are self-explanatory, truly pocket sized and made of some kind of glossy paper than is wipe clean and very durable. The first is titled “Mosel-Radweg”. This map covers the Mosel cycleway which runs along the entire length of the river from Perl (close to the French border) all the way to where it converges with the Rhine at Koblenz. Markers are indicated at 5km intervals from Perl making it easy to plan a ride of any desired length and the detail is excellent. The other map covers the “Moselsteig”, which is a river trail for walkers. Like the cycle map, this one also covers the route from Perl to Koblenz and has the same handy distance markers. Both maps plenty of tourist information on them. Whilst this is also in German, it is easy enough for those with a basic grasp of the language to follow. I love these maps for their clarity, detail and sheer convenience – perfect when you are cycling or walking, which in my opinion are the best ways to explore the region.